This is a Sponsored post written by me on behalf of Baby-G for SocialSpark. All opinions are 100% mine. Whether you love or hate Kesha, she has become a musical icon over the last two years. She has a signature sound that is undeniable and has come out with some of the catchiest songs pop radio has heard recently. The best part about Kesha’s rise to stardom is that she is so different. She is a “wild child” that speaks freely, parties, and ultimately does what she wants. She doesn’t follow the normal rules that a more conservative artist sticks to. That’s why Casio has decided to team up with Kesha on a line of new watches. The best part about all of this news is that Casio is giving away some of these Baby-G watches in their Baby-G sweepstakes. All you have to do is head on over to their Facebook page, like it, and send out a tweet telling everyone which watch you like best. Then, you’ll be entered to win. You can read the complete contest rules if you need any more information on how to enter correctly. Good luck in the contest. Please leave a comment below if and when you enter. We’d love to see how many of you enjoy the watches. I thoroughly enjoy when someone changes the way we consume media. I was on the forefront of the advent of blogging about new music many years ago, and watching what blogging and social media has done to content distribution over the years has been utterly fascinating. The same thing can be said with a great deal of other online content being released today. Production companies and marketers are starting to get very creative…. and I love every second of it. The video series called the Untitled Jersey City Project is no exception. The show is a great example of the result from the process of having an interesting concept and storyline and deciding to distribute it in a unique way by leveraging a plethora of resources. What makes the Untitled Jersey City Project so enjoyable is that each episode is broken down into 2 minute sequences that are super exciting to watch. You’d be surprised all that can happen in just a few minutes. I watched the first episode and I can honestly say that I am now hooked. There is so much mystery being presented right off the bat that it’s hard not to roll right into the next set of episodes. I suggest you guys check out at least the first episode. Again, it’s only 2:30 in length so even if you hate it, it won’t be a complete waste of your time. I have embedded it below. Please leave your feedback on it in the comment section below. The best way to expand wealth is spending a lot less money than you make every month. There’s not much more to it – Without a doubt – Hook, line and sinker. With mortgages/rent, insurance, car payments, taxes, and all of the other financial responsibilities we are plagued with, taking shortcuts anywhere you can is the key to long-term financial success. For a lot of families, cell phone bills play a large part of the monthly monetary burden. Most of the large cell phone companies charge an arm and a leg for minutes, texts, and data plans. Before you know it, you’re paying over $100 a month per line for these plans. With a mobile solution called Straight Talk, you get Everything you need without the lengthy contracts and large monthly bills. For only $45, you can get unlimited everything on your plan. Compare that to your current $130 plan and you have yourself a first step to your new wealth building formula. The best part of all of this is that Straight Talk offers refurbished phones for as low as $10 when you start service with them. They are all of the smartphones and PDAs that you would probably beg to have anyway. You can even get an Android on Straight Talk. How cool is that? Straight Talk is available at all Wal-Mart locations. You should Call a friend and tell them to sign up with you. I’ll leave you with a Straight Talk commercial, embedded below. The best way to build wealth is by spending a lot less money than you make every month. With all of the monthly bills piling up, cutting corners anywhere you can is the key to long-term financial success. For a lot of Americans, cell phone bills play an integral part of the monthly financial burden. Most of the large cell phone conglomerates charge an arm and a leg for minutes, texts, and data plans. Before you know it, you’re paying well over $100 a month per line with these large providers. Don’t you think it’s time to See the Light? With a new independent mobile provider called Net 10, you receive everything you need without the long contracts and large monthly bills. For just around $50 a month, you can get unlimited everything. Compare that to your current $130 plan with that big company and you have yourself a shortcut to personal wealth. The best part of all of this is that Net 10 offers refurbished phones for as low as $10 when you begin your service with them. They are all of the smartphones and PDAs you would want with any other mobile service. Do yourself a favor and see What Rob has to say about Net 10. You can also find out what a Real NET10 customer has to say about the service. Finally, check out Net 10 on Twitter and Facebook and watch this Cute NET10 commercial embedded below. This is a Sponsored post written by me on behalf of Diageo for SocialSpark. All opinions are 100% mine. For those that don’t know, my ENTIRE life isn’t just music. I also have a strong love and admiration of fine wine and liquors. In fact, it has become a major part of my wellbeing over the past few years. While I may not have the resources to consume some of the oldest wines and the finest spirits, you better believe I drink plenty of rum whenever I get the chance to. I’m sure all of you have heard of some of the more common names in the rum industry, but I have something far better and more interesting for you to try. The brand of rum is Zacapa premium rum. They offer the smoothest rum that has been put into a very complex aging process. The process creates a very unique and bold flavored rum. To be exact, Zacapa is a premium dark rum. If you’d like to learn more about the Zacapa creation and aging process, please visit www.zacaparum.com. Even better, you can sign up for the Zacapa Society directly on the site. As a member, you will not only learn more about the phenomenal brand itself, but you will actually have a voice to become a direct influencer inside the society and its members. You may even win rewards along the way as well. Check out Zacapa and leave your feedback on it in the comments below. This is a Sponsored post written by me on behalf of ampm for SocialSpark. All opinions are 100% mine. I am so excited right now. 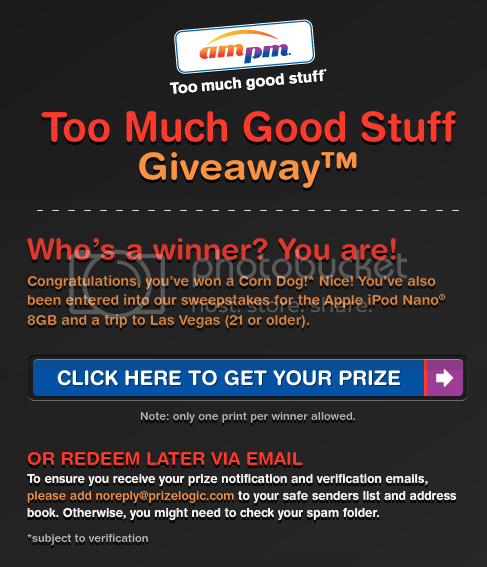 I just entered the Too Much Good Stuff Giveaway Contest through ampm’s Facebook page, and I won the instant slot machine. I grabbed a screenshot to prove it. As you can see, I won a corndog that can be redeemed at any ampm location. I could have also won 15,000 Pepsi Maxes or 10,000 corn dogs – which would have been overwhelming. Even more exciting than that is the fact that I also automatically got entered to win the grand prize, which could either be a trip to Las Vegas or a myriad of Apple products. It’s very simple to register for the contest. After you visit ampm’s Facebook page, all you have to do is “Like” the page and enter your personal information. After you submit the information, you will be taken to the virtual slot machine where you will be able to win a prize. Hopefully you’ll be as lucky as I was. I always enjoy visiting ampm locations and I can’t wait to redeem my corn dog voucher. I’ll be sure to couple it with a flavor from their popular “Thirst Oasis” which features over 24 fountain drink flavors. Leave your comment below and let me know what you won after you enter the ampm Too Much Good Stuff contest. I look forward to hearing about what you won. This is a Sponsored post written by me on behalf of HBOseries. All opinions are 100% mine. There is a fine line between great music and great film. Beyond that, one could argue that all forms of art are closely-related and often intertwine with each other to enhance the listener and/or viewer’s experience with a particular piece. A great example of this being executed properly is in a hit television series. The scores and theme songs are always right on, and every aspect of the final product is very enjoyable. Deadwood, one of my personal favorite HBO series in history, is a television show that executed in every way imaginable. The story was thick, the settings were beautiful, and the music was always spot-on. It takes a lot of work to achieve perfection and the Deadwood series was as close as you can get. For those of you that may be just as big of a fan as I am of Deadwood, today (February 3rd), Amazon.com will be offering an amazing Gold Box deal of the entire series. The deal has been discounted heavily for this day, so act fast if you’re interested. The funniest thing about my personal love for Deadwood is that I’m not particularly fond of the American West. While they do play a role in the overall schema of American cinema and history, Westerns just aren’t my thing. I personally believe I was more engulfed in the character development and the story than I was the overall theme of the show. It just goes to show that nothing beats great writing. Deadwood is definitely a show that you’ll want to experience all at once. It’s the entire series that makes it so wonderful. That is why I highly recommend checking out the Amazon offer and consider buying the entire series in one fell swoop. After you do purchase it, please leave your comments and photos of you with the package. I would love to see the smiles on your faces.